A hugely powerful device, without the mega price tag. The Honor 8 Pro combines high-end hardware with a smooth and polished design. It's easy to use and will comfortably last all day, but is lacking that little bit of sparkle that could tie it all together. The Honor 8 Pro is the latest premium smartphone from the Chinese manufacturer, best known as a offshoot of tech titan Huawei. The company has grown hugely in the past few years as it looks to offer customers an alternative to the typical Apple or Samsung handsets, offering powerful hardware at a more affordable price. On sale now for £474.99 from the company's own Vmall online marketplace, the Honor 8 Pro looks to be the biggest challenger yet. Building on a number of past handset releases, the Honor 8 Pro is targeting the premium end of the smartphone market, but with a price tag that's slightly less than you'd pay for an iPhone, Google Pixel or Samsung Galaxy S8. Despite its aim of taking on the likes of the top Android devices from Samsung, HTC or Sony, at first glance it's hard to spot anything too striking with the Honor 8 Pro. Featuring a rounded metal and glass body that bears more than a passing resemblence to Apple's top device, the Honor 8 Pro is comfortable to hold, but its slimline build (at just 7mm across) can mean that it sometimes feels a bit slippery, which isn't ideal if you're heading somewhere fast. The 5.7 inch LCD touchscreen display offers a widescreen experience, with the screen stretching across the whole face, however there are some rather chunky bezels at the top and bottom of the screen. There's a 3.5mm headphone jack in the bottom left corner on the device, which may make listening to music or making hands-free calls a bit tricky if you normally carry your phone around in your pocket. The rear of the Honor 8 Pro is beautifully uncluttered, with just the fingerprint sensor near the top of the rear panel, as the dual-lens camera is moved up to the top-left hand corner. Admittedly, the fingerprint reader is a tad small, meaning you may struggle to unlock it first-try when initially using the device, but it does come with a couple of handy feature, such as the ability to answer calls, take a photo, or stop alarms with just a touch. One of the most impressive aspects of the Honor 8 Pro is just how much has been squeezed into the device. The Honor 8 Pro is powered by Huawei's own Kirin 960, which isn't as powerful as the top-end chips from Apple and Qualcomm, but runs them both pretty close. There's a choice between 4 or 6GB of RAM, backed up with 64GB of storage, meaning that for the price you're paying there's a lot of power within. Charging is done via USB-C, with the Honor 8 Pro boasting a huge 4,000mAh battery, which is easily enough for all-day usage. Our tests found that the phone lasted over a day, despite heavy usage of web surfing, social media and watching video. It's an incredible battery for a device so slim, and definitely stands out as one of the Honor 8 Pro's key features. However the Honor 8 Pro doesn't benefit from Huawei's partnership with iconic camera maker Leica, which has seen the likes of the Huawei Mate 9 and Huawei P10 sport boosted sensors, meaning that photos are good, but not spectacular. If you've ever used an Android smartphone before, you'll immediately be comfortable with the Honor 8 Pro - but if you've ever used another Huawei or Honor device, you'll be speeding along. The device is powered by Android 7.0 Nougat, meaning all the usual apps and services are present - with the notable exception of the Google Assistant. However once again, Huawei has overlaid its own EMUI 5.1 interface on top of this. This allows for a bit more personalisation, with a whole range of custom services and tools, but as with past devices, also loads the Honor 8 Pro with unneccesaary bloatware. It's a real shame, as Huawei seems to have learnt little from past criticism. Asides from these quibbles though, the Honor 8 Pro is a breeze to use. The phone is quick to boot up and get ready, with navigation through app menus slick and speedy too. So is the Honor 8 Pro worth your money over an iPhone or Galaxy S8? The device has a lot to recommend it for, bringing together a polished design, slick hardware and a huge battery life - all of which make this pretty attractive prospect. However there just seems to be something lacking - a killer feature, or USP - which stops us just short of giving it a top rating. The Honor 8 Pro is missing a certain something, maybe to give it a bit more shine, or refinement - something that would help set it apart. 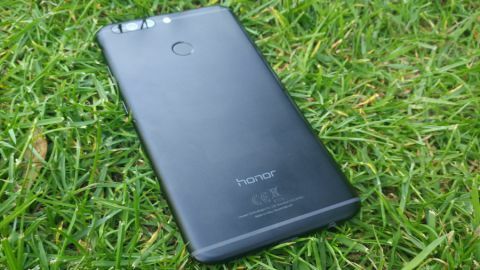 Make no mistake, this is by far and away the best Honor smartphone yet - but if you're looking for a powerful, long-lasting work phone, it's probably best sticking to the big brands for the time being.